This is gonna be a quick post. B) No, scratch that I am exhausted. Yesterday, I decided to make up for my skipped run due to rain. So G and I set out to tackle an easy four miler. The heat was bearable, and the humidity was meh. Us runners should be use to it though. We constantly complain about the heat, the humidity, the cold the wind, the sun, the air..erm not the air. Regardless of the conditions, we will probably complain. Well...I will probably complain. Maybe I should speak so generally? It was just like any other four mile run, except I am all like time obsessed these days. My head keeps telling me I need to be pushing sub 8s, and my body is like "uhm what the frick? no." Mentally, I want to be back to where I was last year at this time. Holding an 8 for 8 miles, the idea of doing that now makes me want to vomit a little. Speed takes soooo long to develop, and yet it takes so little to lose. Frustration. Forget my nay saying, it was a pretty good run. Toward the end though my legs bricked pretty bad and I felt like I was running in sand. I think it was a tad dehydrated. Goliath was so tired. I dunno what was up, but he actually sat down in the car. He NEVER does that! Late last night, Logan and I were eating our dinner. Yeah, it was almost 11PM and we finally got around to eating a nutritious dinner of chicken nuggets and twizzlers. I am not even ashamed. Sometimes, you gotta eat chicken nuggets and twizzlers for dinner. 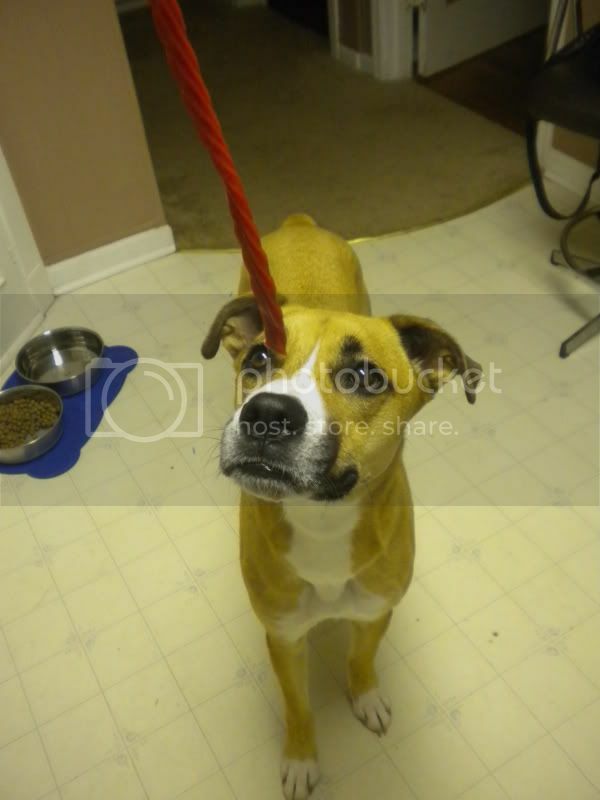 I may have gotten a ltitle carried away and started being Twizzler Ninja when I started hitting Logan and teasing Goliath. 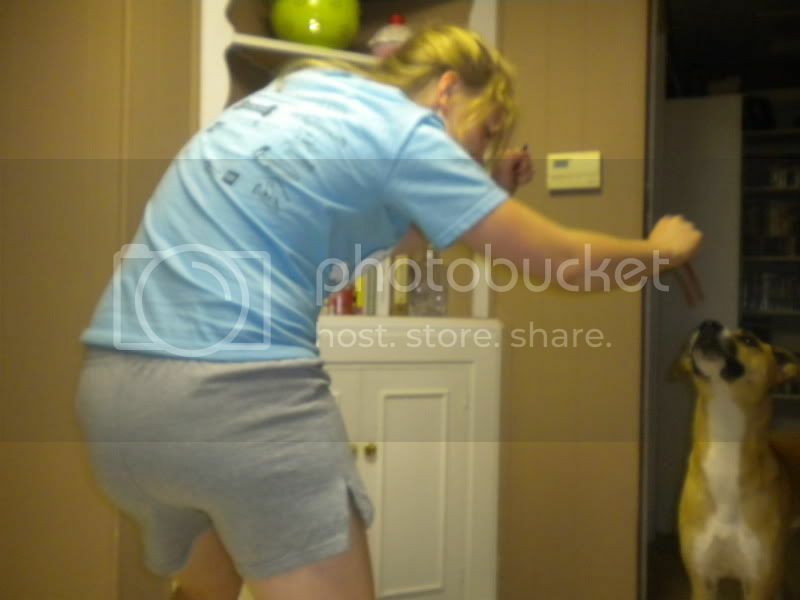 I know it looks like I am just dangling it in his face, but I was dancing around and swinging them like nun-chucks. When I would hit Logan with them, Goliath would intervene to defend Logan. 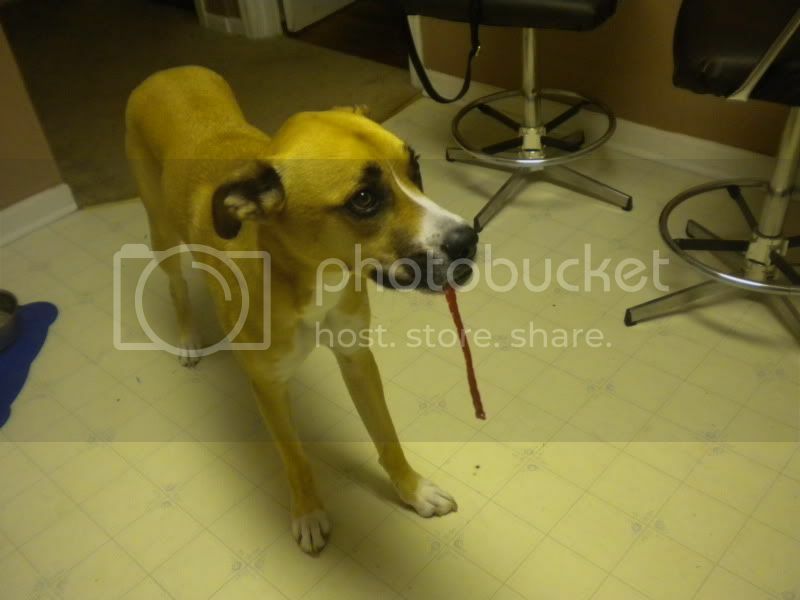 But instead of going to play fight back, he just went right for the twizzler. My dog knows what's up. G's down with the Twizzlers. but hours of loose bowels. WHAT KIND OF WEATHER CONDITIONS DO YOU HATE? WHAT SHOULD I DO WHILE LOGAN IS GONE?! Obviously, I've been doing a lot of reflecting lately. As the W&R Marathon approaches, I can't help but be pensive about the mileage that has gotten me here. The problem is: thinking about what you have done doesn't really help you get what you need to do...done? I have a little over a month left. I have a 20 mile run scheduled this weekend. I have my clothes planned out. I have printed the map three times. I have counted down the days for almost a year. I have never been so overwhelmingly consumed with one thing ever before. It's not an exaggeration when I say it's ALL I think about. On Saturday, I had my first month lifetime weigh in and spent the rest of the afternoon hanging out with Goliath. We tripped to the dog park, and pretty much just maxed in bed allllll day. I needed the rest. I need a day to just NOT think so farting much. The weather has been absolutely gorgeous, and yet the dog was fairly empty. We walked a few laps, drudged the mud and explored the wooded areas. These pictures crack me up...sorry. Not even kidding, I spent all day Saturday....and well most of Sunday with the G-Dog. We did some running Thursday, Friday, and Saturday. For the most part, my body has been completely cooperative but recently old injuries and problems have been surfacing. My stress fracture sites are flaring up, my toenails are on the brink and I am trying the find a balance in over and under hydrating. When I run I have zero problems, in fact these days I've felt better than ever. Something in my brain shuts down, I feel no pain and can go for miles. The second I stop, for water or for Goliath to drop a deuce something will get me, albeit nausea or shin pain. I'm doing my best to stay on top of overuse injuries, and experiment with gatorade. Today's run was a different story. I thought I had found the key to feeling like trash after runs, but guess not. Sometimes dehydration isn't as simple as drinking water. I have been drinking a suggested about of water, and gatorade before and after runs-but even with that I couldn't help but feel like puking at my split today, and as I arrived home. Something just isn't right, I can't pinpoint it but mark my words I will get to the bottom of it because I can't handle how I felt, and feel now. Maybe I just need to get back in bed. 12 DAY of GIVEAWAYS UPDATE: OK faithful followers, the time has arrived! I can't believe we got so many subscribers over the weekend! Thanks! Be on the look out, the 12 days of giveaways will be starting any day, any moment-and be ready, you're gonna want this stuff!! I've got a full page of things to give away including...hah, sike-no clues, pay attention! It will be because of stress, and said stress making me push myself too hard during a run. Obviously, things haven't been going my way and my training has been kinda wayward. I run when I can, and when I can isn't very often. So my lack of updating is due to my lack of real training. Not that I'm not running I'm just not really training. I'm still running, but more for my sanity and more like "Oh Ok I have twenty minutes lets get two miles in and head to work stinky." In the last two weeks, I have worked nearly 200 hours. No lie. Two jobs, and one coming to an end really took a toll on me: mentally, physically and emotionally. My head and my heart are in a million different directions, and my to-do lists have escalated and when I sit down to accomplish something I'm ignoring something else that has equal priority. Like right now? I smell so bad. I need a shower, clean and do laundry-my poor husband wore his swim trunks out last night. HE could easily do the laundry but it still made me feel guilty. When push comes to shove, me and my family priorities fall by the wayside and everything else comes first. It's just a huge character flaw. THIS NEEDS TO CHANGE. So I did. I resigned from a position, and had my last day yesterday. It was so bittersweet, and I cried my whole way home. It's hard for me to be the one to "give up" or "quit" especially on such a personal employment and commitment. But the bottom line is this: if I didn't stop this commitment my other commitments would ultimately terminate because of my lack of focus. I know this post doesn't seem to be directly about running, or marathoning or being a dog-mom-but it is. Indirectly. Whatever it is you commit to do, you really have to have to confidence and desire to put 100% and sometimes even 70% will get you there-but if you commit to five things how do you give 100% or even 70%? You can't. Exerting yourself 20% gets mediocre results. Ya'll know how I feel about mediocrity. I finally feel like I'm getting caught up on sleep, and laid around this morning until about 10. Golaith whined all morning, and I had no reason not to run this morning. After a week of ignoring my 5am alarms to run-I finally laced up and press start on the 405. As hot as it has been, it was VERY decent outside. Very decent? That makes no sense, but I think 86 degrees with 70% humidity and the heat index at 93degrees calls for "very decent." 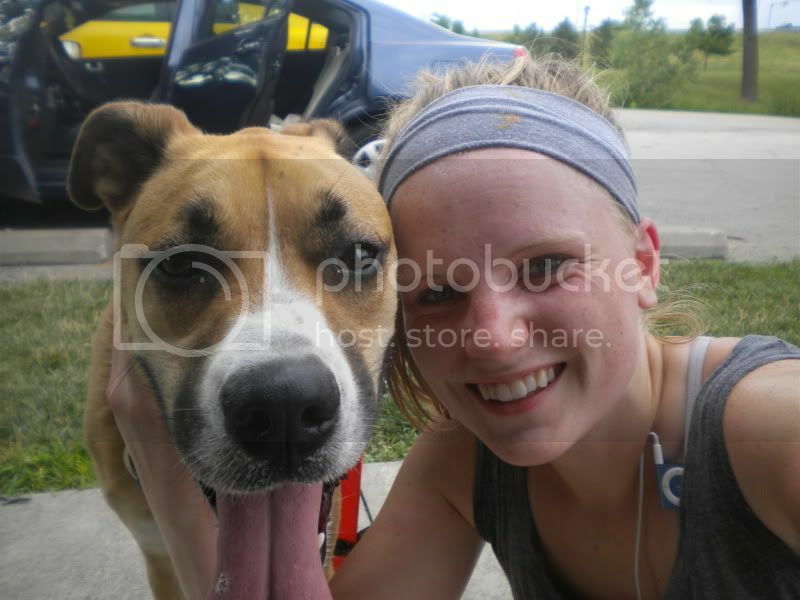 Goliath and I had an awesome 10k run. I stopped frequently to let him drink, and cool off-so don't call me negligent. We have a need to feel that thunder, so we pushed 9s and then a negative splits of 8s. Amazing run, and I don't think I've been this sweaty in weeks. Heat exhaustion tried to set in, I felt myself getting chills around mile 5-so I took out the headphones to pay closer attention to my body, eased up and ultimately finished strong. On a run like this, I know DOMS will arrive sooner than later so I'm off to spend a solid half hour on my foam roller. Sunday = Long run day! I think it was so exhausted, that it's prevented me from updating. Goliath and I woke up around 4:30AM to run 9 miles. Why so early? Well we had plans at 10AM and that's the price you pay for being a marathon-runner-in-training and, I guess being my dog. When we started pacing, it was slightly humid and still dark. The fog lifted, and then the rain set in. It misted, then it sprinkled and then it poured. By the time it was dumping inches, we were at our split and waiting it out under a bridge. Several other runners and bikers whized by, probably thinking we were wusses-but the short break paid off. The rain halted, we set off and half a mile later it picked back up. As it was raining, I started thinking about my half marathon PR at Rock the Parkway. It was pouring rain, even hailing. I thought of this because, never have I ran so well in my life until that race and it was in horrid conditions-so why not during training am I sluggishly pushing each quarter mile and dreading the rain? Maybe it was the leash burn or maybe lack of sleep, but just recognizing that I could perform better in worse circumstance made me run just a little better. Goliath, of course, ran just fine. Especially with the prospect of creamy Jiff in his future. OK FOLKS: My rest weeks are over. I gave myself two weeks to "rest" before full marathon training. I think we all know why rest is in quotes, I did run slightly. Nothing over five miles, and did do Dog-n-Jog-but nothing major, nothing that would injure myself and nothing that boosted my lactate threshold. And since this blog is about honesty, this week (week one) of training was basically non-existent. I hadn't fully wrapped my mind around training. I think if I don't start, maybe it won't happen? Am I chickening out? ...no...psh...no....ok maybe. I'm sorry, the thought of running 26.2 miles TERRIFIES me. Training for a half didn't intimidate me at all, 13.1 really seemed totally manageable. But double that, and I'm shaking in my nikes. Seriously, who's idea was this? Oh right, mine. I'm registered. I have a solid training schedule. I have a great running buddy, and support for long runs. Why am I so nervous? The thought of crossing the finish line nauseates me, and gives me chills. This will be, hands down, my biggest physical accomplishment-maybe even take out that modifier, my biggest accomplishment. I feel that if you can run a marathon, you can pretty much do anything. If you can have the wherewithal and the mental fortitude to run 26.2 miles, then you have the great glass elevator. You can go anywhere, you can do anything. True to form, I've set some lofty goals for this marathon. Nope, finishing isn't enough. People "just finish" marathons all the time. At the KC Marathon I will: 1) Run the entire thing, only stopping for stations and maybe stretching 2) Finish sub4 hours 3)Set a half marathon PR 4)Really enjoy it. Oh my, is it really Tuesday? Have I really gone this long without updating you? Shocker! Well, it's official, marathon training is in full swing and my schedule is three days of running and three days of cross training and one full day of rest. So how does this really translate in Julia+Goliath land? Three days of running, and three days at the dog park. Schedule in mind, I'm still trying to fit Kyle into the mix and help him with endurance and taper myself for a half marathon next week. Juggling the aforementioned has been tricky, but since I'm "tapering" cross training is kept to a minimum. Long runs fall two days after a tempo or speedwork day, and that meant Friday was LRD. Have you ever seen me post about a long run on a Friday? Or what about a run on Friday at all? Truth be told, I don't think since I've started running I've ever put in serious mileage on a Friday. Mainly because my Weight Watcher's meetings and races are typically Saturday mornings. Regardless, after work on Friday (yeah, in the evening too...) Goliath and prepped up for what was sure to be a grueling eight miles. Let me get the whines out first: It was HOT. It was HUMID. I was TIRED. It was MISERABLE. There, with that said it was the most gratifying run I've had in a long time. I had to stop every so often, and my sweat was coming down in torrents but I finished it. Unintentionally, I went at marat-race pace which is what I'm suppose to be doing anyway so it worked out. 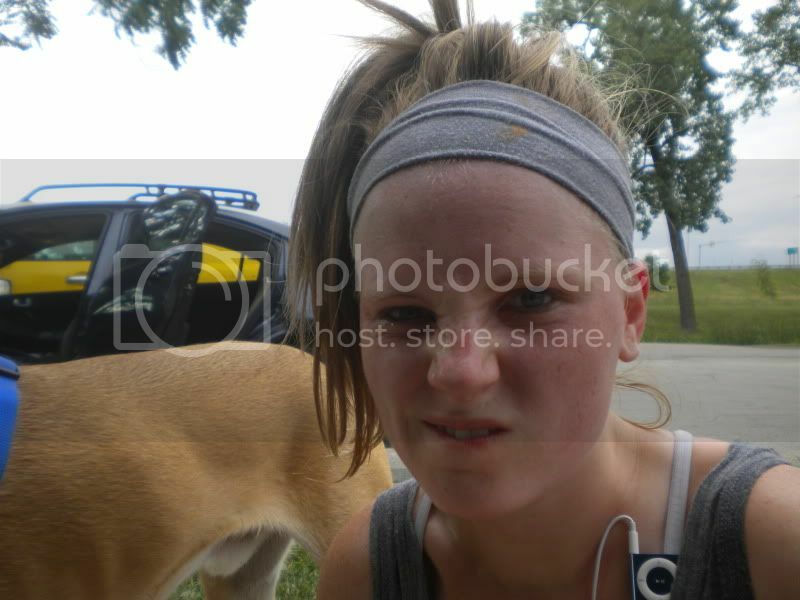 The heat and humidity really took a toll on my endurance and my attitude. It's not like running in ten below, where after five minutes you get acclimated. The heat doesn't go away, and it only gets worse with every mile. The good news? We saw a DEER! It was a baby buck, and I was so delirious that at first I thought it was a great dane off it's leash. It took me a whole minute to process, oh hay that's no Marmaduke! Goliath wanted to play with the little guy so bad, and for a second I thought the buck wanted to as well. He inched toward us, as I stood completely still- isn't that what deer do? Goliath's whining to get off-leash eventually spooked him off. Like the brilliant genius that I am, I also did not realize that the city water fountains are on! HOLY BALLS! This was a game changer. I almost went hypoxic guzzling water. Hilariously, this old gentleman sitting at a picnic table stared blankly at me as I drank like I had never seen water and when I finally had my fill, he said "I hope you left some for the rest of us." No sir, I didn't. The entire city of Overland Park will now be without water until the troops can bring in reinforcements. Well, we're back! Aspen was beautiful and vacation was needed. The absence from Goliath was nearly more than I could take, I think I might have a little separation anxiety myself. Call me obsessive and crazy-but I love my dog, he makes me smile when no one else can and he goes with me when no one else will. It's been nearly two weeks since I've laced up the Bowermans, and secured the leash. And I'm really feeling it. It's right about this time where the hormonal low starts to get to me. The depression sets in, and the motivation isn't hard to find. The problem? My health. It's the total pits right now. Without getting into all the gory details, and sparing you photographs I had some minor oral surgery on the previous Friday, and there were complications, and complications to the complications. I'm on high dose pain killers and oral and intramandibular antibiotics for the next three weeks, when I will have hopefully my last round of surgeries. This couldn't have happened at a more inconvenient time. Of course right after vacation and the dead middle of marat training. I've missed so many days of training, that my fitness level and lactate threshold will be null. I've laid in a bed for a week, I've lost a little over ten pounds. Ten pounds of muscle mass. I'm nervous. What do you do after set backs? Where you pick back up in training? Usually, I'd just go out for an easy run to see what I can do. I want to be 100% but I can't wait another day. I don't want to push myself too much too soon, but that's kind of who I am. I've come to accept that I'm an "all or nothing" kind of person, but I've also come to accept that this part of me needs to change. It's why I keep getting injured, It's why I'm considerably more frustrated with my training than your average runner and It's why I've never been able to just relax. When I'm not pushing myself there's a knot in my stomach that's akin to that rock you get when you feel guilty. It probably is guilt. Guilt because I know I can do better than whatever it is I just half butted. While I know it's not healthy to be this hard of myself, especially while I'm trying to recover in the first place, I don't really know any other way.